The world's largest aid effort, in Darfur, is in danger unless more effort is made to end the violence there, according to the UN's new humanitarian chief John Holmes. He's just completed his first visit to the region. 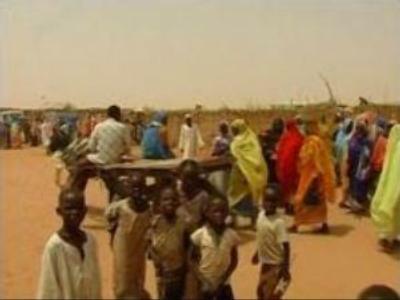 Over the last four years, 4 MLN people have been caught in the violence in the Sudanese region of Darfur. Ethnic Africans have suffered most at the hands of a predominantly Arab government and the country's pro-administration Janjaweed militias. 200,000 people have been killed. Others, some 2.5 MLN survivors, are living in displacement camps where they fled to escape the fighting. A number of refugee camps are all part of a massive global humanitarian aid effort. However, the UN's new envoy warned that morale amongst relief staff was now fragile after continued violence and obstruction from the Sudanese government. “The pressure we can exert is in talking to the Sudanese government, pointing out that we are all trying to achieve, I hope, the same objective – which is keeping the people in Darfur alive and as well as possible and in as good condition as possible so that when peace comes they can return to their homes and resume their normal livelihoods,” stated John Holmes. Restrictions on the roads limit the access of aid agencies. Medical, food and water supplies are struggling to get through. “We are sending convoys filled with food out into the desert to remote camps and villages all the time. However, it is very dangerous – the roads are patrolled by bandits so those convoys have to be escorted by peacekeepers, provided by the African Union,” says Simon Crittle from the UN World Food Programme. Meanwhile, the international community is threatening to impose sanctions on Sudan, and at high-profile events like the EU's 50th anniversary celebrations, pledged to place the restoration of peace in Darfur high on its agenda.